Mrs. James Bond. "Mrs. James Bond" - an 'OHMSS' 바탕화면 created 의해 TheCountess with Diana Rigg starring as Tracy Bond *** 더 많이 Diana Rigg 바탕화면 at. HD Wallpaper and background images in the James Bond club tagged: ohmss james bond film wife tracy bond diana rigg fan art wallpaper thecountess 007. 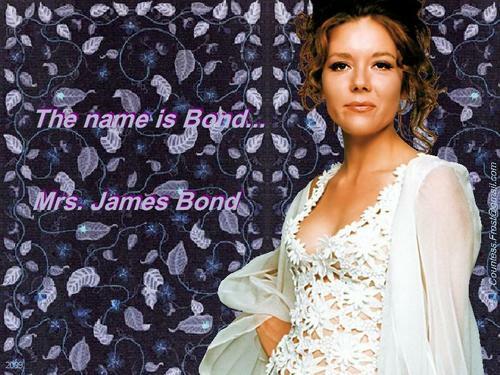 This James Bond wallpaper might contain 칵테일 드레스, 시스, 칼집, 칼 집, 드레스, 잠옷, 가운, 나이트 가운, nightdress, 잠 옷, and 드레스. You'll have to watch "On Her Majesty's Secret Service". It's my favorite Bond film.